Mark your calendars for the Haile Farmers Market 2018 Holiday Festival! Saturday the 15th of December, 8:30 am-Noon. We'll be hosting handmade craft of all kinds, hot cocoa, live holiday music, food tastings, a canned food drive, and a visit from the one and only SANTA! Bring the whole family for a day at the market to celebrate the holiday season. We accept vendors who make their own products, not resell products. Please fill out our event registration form at https://goo.gl/forms/Jh5j0nByDMSBhH4I3. Special event booths cost $30. This week we will have local food educator and chef Stephanie from Hogtown HomeGrown for the the second lesson of the Community Cooking Class. Last month Stephanie taught us how to BROIL and this month we learn to BLEND! We will have a soup, a custard and one other blender item to sample. Check her out here for her article with TV 20. On October 18th, at 8:30 pm a mass email will be sent to the email address you are currently reading from and link posted on the website. This is the link to the sign-up for all Saturdays in this sign up range. There will be 10 Saturday's in this round of sign-ups, so it is possible you will not receive a spot. It is your responsibility to sign up for a date. If all dates are filled, you will have to wait for the next round of bookings. I apologize to anyone who doesn't get a spot this time around, but there are always more musicians than days in the year, and we encourage you to keep trying back each sign-up session. A more detailed list of rules will be provided on the sign-up page. Musicians are scheduled to arrive at the market at 8 am, this is to allow for parking and set up time. Music doesn't have to start until the market opens at 8:30 am. 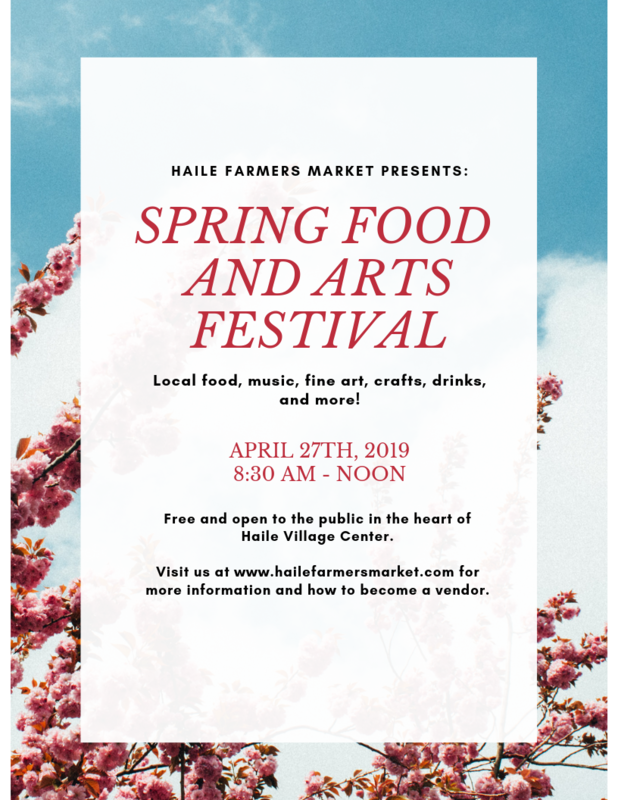 Mark your calendars for the Haile Farmers Market 2018 Fall Festival! Saturday the 10th of November we'll have special extended hours, 8:30 am- Noon. We'll be hosting handmade craft of all kinds, special kids events/crafts, live music, food tastings, a fall family photo-opt, and much much more. Bring the whole family for a day at the market to usher in the cool weather to north central Florida! We accept vendors who make their own products, not resell products. Please fill out our event registration form at https://goo.gl/forms/DlN9OLBlvcSLLaZ22 . Special event booths cost $30. In sign-up, you will be able to sign up for 2 Saturday's between 8/4/4/2018 and 10/13/2018. There will be 11 Saturday's in this round of sign-ups, so it is possible you will not receive a spot. It is your responsibility to sign up for a date. If all dates are filled, you will have to wait for the next round of bookings. I apologize to anyone who doesn't get a spot this time around, but there are always more musicians than days in the year, and we encourage you to keep trying back each sign-up session. You will receive a reminder email one week before your scheduled date. You may swap dates with another musician if they need to cancel a date. Enjoy the sweet songs of the Joey's Wings Children's string quartet. Enjoy the sweet songs of singer/songwriter Julien Kozak. We have Chef Stefanie from Hogtown homegrown teaching us more about Roselle. She's cooking four recipes to compliment holiday meals including, steamed green beans- 4 ways, green beans with caramelized onions, Katie's carrots with rosemary, and calamondin coleslaw with roselle! Any of these side dishes are sure to brighten your holiday feast. UF Culinary Club will join us at the farmers market to share a fresh farm-to-table recipe created from the weeks produce. Learn how to cook with new produce and special techniques that will make your dinner party talk of the neighborhood. Enjoy the Musical Styling of local singer/songwriter Julien Kozak. Enjoy the musical styling of John and Lisa, a Hawian swing duo. Enjoy the musical styling of "Ron Schmidt. Enjoy the Musical Styling of local singer/songwriter Calvin Head.